Professional Plumbing can service all your plumbing, heating, air conditioning and gas line needs. We guarantee our work. Our business name is our standard . . . . we will solve your sewer, drain or any other pipe-based problem in a professional manner. If you are not happy with our work, we are not happy. We service both residential and commercial customers for all plumbing and sewer services. 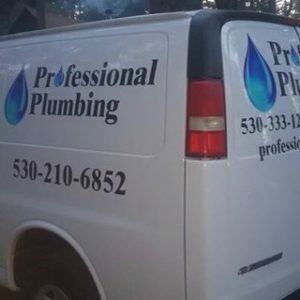 We are located in Placer County and have been fixing plumbing problems since 1988. We also service El Dorado County and other outlying counties in the Sacramento area. For those of you in or near Georgetown, Ca, we have a satellite office located there, and can respond very quickly to Georgetown (and Cool, Ca) residents. Camera Detection Service NEW !! !